Paul Green's second-half strike ensured Ipswich finished the season in the Championship's top 10 with victory over Sheffield Wednesday. Tommy Smith gave Town the lead when he tapped in shortly before half-time after Damian Martinez failed to hold onto Daryl Murphy's shot. Kieran Lee equalised for the Owls from close range after Caolan Lavery miscued his shot. Green made sure of the win when he headed in Stephen Hunt's free-kick. Stuart Gray's Wednesday, who finished the season in 16th, created more chances than their hosts. Sam Hutchinson and Atdhe Nuhiu both went close with headers, while Ipswich defender Luke Chambers made a brilliant block to deny Michail Antonio. Ipswich boss Mick McCarthy on finishing ninth: "It is progress and I am immensely proud of the lads - I think they have been great. "I think the majority of fans have appreciated the effort of the players and we have certainly appreciated their support. "We have not spent a note on anyone coming in and the nucleus of the side will be here next season. "When you look at the teams below us - Forest, Huddersfield, Bolton - they have all done it differently." Sheffield Wednesday boss Stuart Gray: "I am a little bit disappointed with how we have ended the season. With 21 goal attempts, we should be doing more. "We probably deserved something from the game, whether a win or a draw. "But credit to the players for how we have ended the season. We started with something like one win from 18 games. We have fizzled out a little at the end where we have probably been overstretched." Match ends, Ipswich Town 2, Sheffield Wednesday 1. Second Half ends, Ipswich Town 2, Sheffield Wednesday 1. Attempt saved. Chris Maguire (Sheffield Wednesday) right footed shot from outside the box is saved in the centre of the goal. Assisted by Jacques Maghoma. Corner, Ipswich Town. Conceded by Sam Hutchinson. Offside, Sheffield Wednesday. Oguchi Onyewu tries a through ball, but Sam Hutchinson is caught offside. Hand ball by Kieran Lee (Sheffield Wednesday). Offside, Ipswich Town. Jack Marriott tries a through ball, but Daryl Murphy is caught offside. Foul by Michail Antonio (Sheffield Wednesday). Daryl Murphy (Ipswich Town) wins a free kick in the attacking half. Substitution, Ipswich Town. Jack Marriott replaces Frank Nouble. Attempt blocked. Sam Hutchinson (Sheffield Wednesday) right footed shot from the centre of the box is blocked. Assisted by Jacques Maghoma with a cross. Oguchi Onyewu (Sheffield Wednesday) wins a free kick in the defensive half. Foul by Frank Nouble (Ipswich Town). Attempt missed. Jacques Maghoma (Sheffield Wednesday) right footed shot from the left side of the box is close, but misses to the left. Assisted by Michail Antonio. Chris Maguire (Sheffield Wednesday) wins a free kick in the attacking half. Foul by Anthony Wordsworth (Ipswich Town). Substitution, Sheffield Wednesday. Jacques Maghoma replaces Giles Coke. Offside, Sheffield Wednesday. Leon Best tries a through ball, but Chris Maguire is caught offside. Attempt blocked. Michail Antonio (Sheffield Wednesday) right footed shot from outside the box is blocked. Assisted by Chris Maguire. Substitution, Sheffield Wednesday. Jeremy Helan replaces Joe Mattock. Attempt missed. Chris Maguire (Sheffield Wednesday) right footed shot from outside the box is high and wide to the right. Attempt blocked. Caolan Lavery (Sheffield Wednesday) right footed shot from the left side of the box is blocked. Assisted by Chris Maguire. Attempt missed. Michail Antonio (Sheffield Wednesday) right footed shot from outside the box misses to the left. Assisted by Chris Maguire following a fast break. Offside, Ipswich Town. Anthony Wordsworth tries a through ball, but Paul Taylor is caught offside. Foul by Giles Coke (Sheffield Wednesday). Attempt missed. Chris Maguire (Sheffield Wednesday) left footed shot from outside the box is close, but misses the top right corner. Assisted by Joe Mattock. Goal! Ipswich Town 2, Sheffield Wednesday 1. Paul Green (Ipswich Town) header from the centre of the box to the bottom left corner. Assisted by Stephen Hunt with a cross following a set piece situation. Foul by Joe Mattock (Sheffield Wednesday). Frazer Richardson (Ipswich Town) wins a free kick on the right wing. Delay in match Christophe Berra (Ipswich Town) because of an injury. Substitution, Ipswich Town. Stephen Hunt replaces Jonathan Williams. Substitution, Ipswich Town. Paul Taylor replaces Tommy Smith. Substitution, Sheffield Wednesday. Leon Best replaces Atdhe Nuhiu. Offside, Sheffield Wednesday. Oguchi Onyewu tries a through ball, but Atdhe Nuhiu is caught offside. 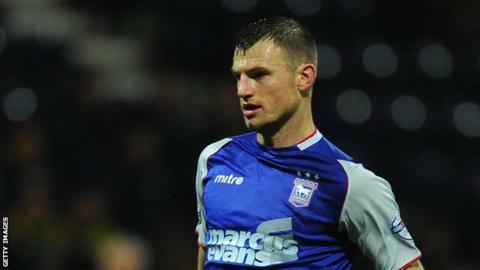 Tommy Smith (Ipswich Town) is shown the yellow card for a bad foul. Giles Coke (Sheffield Wednesday) wins a free kick in the attacking half.